I would be very proud too since I'm not a baker. Fabulous job. 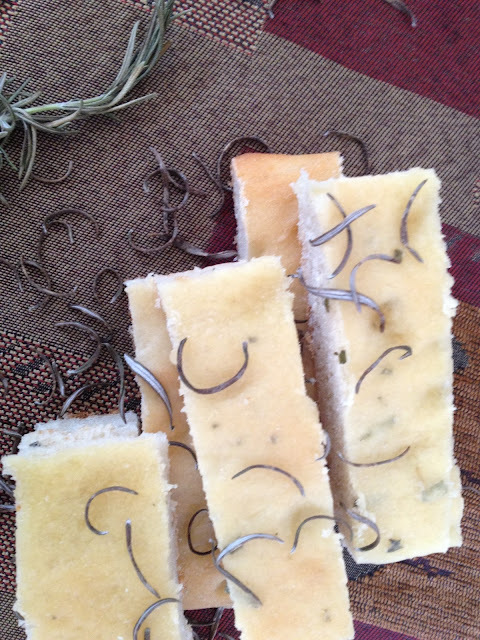 Love that you've used fresh rosemary on top - my favorite herb. And I really am making challah today. There. Now I've said it. Now Ill have to report on my success/failure! I share your fear of baking, but you have given me hope, Rosemary. This looks lovely and I do love rosemary. You meant the herb, right, Mary? I know a couple of successes does not make me a bread baker, but, in this low-carb world, good bread once in a while has to be a treat! I have a foccaccia recipe I used to make all of the time from an old Frugal Gourmet cookbook. It was baked in a pan rather than on a stone and the top was covered with a smear of tomato paste and sprinkled with onions and scallions. For years I used it as an appetizer at parties. Now I miss it. I never have time to work with yeast anymore. I remember how when I first tasted it I was so surprised by how olive oil affects the flavor of bread. I had always hoped to experiment with toppings more, or try stuffing it. That sounds simply wonderful. You must unearth that recipe and share it. Glad to know there's another Frugal Gourmet fan out there. And one ingredient sure can make a difference. Sometimes I think I could drink olive oil. I can only imagine how wonderful that smelled! I'm anxious to smell that challah baking . . we shall see, Krista. It's rising now. Planning to take it to church Easter morning to be blessed. This looks absolutely heavenly! ADORE focaccia! I need this with a glass of wine this evening! I don't know why I waited so long, Carol. I will find a recipe that takes less time but I did want to do it right "the first time." Yes . . . and with wine. I had no idea that focaccia had been around for so long! And your loaf looks just beautiful. I only wish I could have sampled it. Thank you for sharing! Congratulations on your focaccia :) it had to smell amazing. Thanks, Marta . . . it was indeed fragrant. Clever you! it's simply beautiful and I can only imagine how delicious this is! As you might expect, Mr. Rosemary didn't care for it much, so I ate most of it, and still gave some away. I loved it. 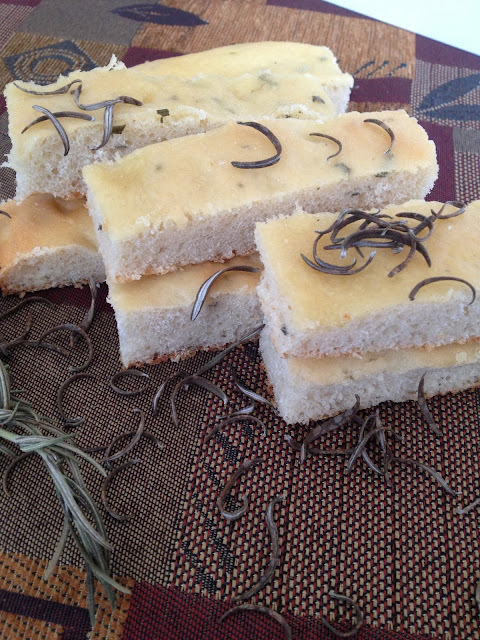 One of my all time favorites...your focaccia looks terrific. I've always liked other people's focaccia, Karen; now I can say I like my own. Thanks, Uru, think I'll even make it again! It was the best for breakfast toast, Liz. Thanks, Mary. I'm much more relaxed cooking than baking, period, but bread is one thing I'd really like to be more comfortable with. I love the smell of rosemary, too . . . I better! Thanks, Velva. It's just a confidence thing. 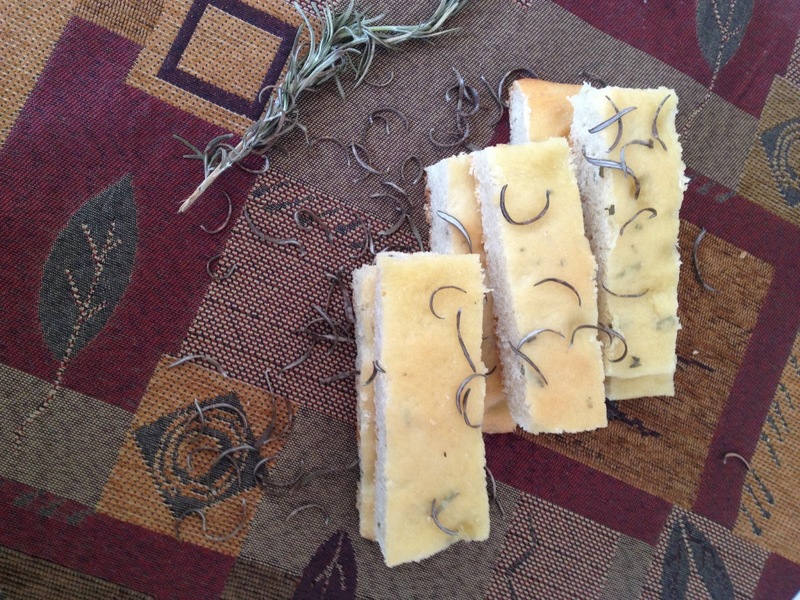 I'd say you did your name proud, with that rosemary focaccia. I can only imagine the smell in your kitchen while it was baking. I have never made focaccia yet . . . isn't that shameful? But I know that when I do, I'll refer to your recipe and most definitely include rosemary! What an incredible herb! Hope you're having a lovely spring day Rosemary! Thanks for stopping by!